This name derives from the Hebrew Adjective “'êythân > êṯān”, meaning “strong, firm, impetuous, long-lived, perpetual, constant, perennial, ever-flowing, enduring”. 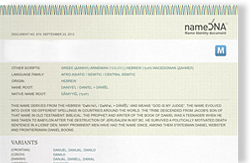 The name is present in the Old Testament, where it is used by at least three characters. One of the most important was Ethan the Ezrahite, mentioned in the Hebrew Bible. It may be that Ethan was a cymbal-player in King David's court. He authored Psalm 89. Charles Spurgeon theorized that this was the same person as Jeduthun. According to the United States Social Security card applications in 2016, the name Ethan ranked 6th out of the top 100 names chosen by parents for their baby boys.